Happy new year guys! I cannot believe that it is 2015, how fast did 2014 go in?! So at the start of 2014, Laura & I done a 'Five things to do in 2014' post and now that 2014 is over with I thought it would be nice to see if I achieved my 5 things! You can check out the original post here! So these were my 5 things..
1) Be happy and stop worrying. In 2013 I panicked over everything and bet myself down a lot. That year was definitely a year that I drifted and lost people who were very good friends which led to a lot of sadness and sleepless nights. I think in 2014 I have to learn that things like this happen and I can't try and fix everything. Deep thought to start this off right? 1) Definitely achieved. I reailsed that if you want to stay friends with someone you will. And that you can't force people to stay in your life - even if you are desperate for them to. Sounds harsh but I don't mean it in a nasty way, just a truthful way! I have the most amazing best friends and they really are all I need! 2) Keep up with exercising and eating well. In 2013 I dropped from a size 8/10 (which I know is not a big size) to a size 6. This was purely due to the fact I wanted to be healthier. After being a chubby kid in primary dealing with constant bullying about my size it feels good to be a shape I am happy with! I am desperately hoping to keep it up! 2) Slightly achieved! Not so much the eating well! Though I haven't gained a pound since last year that I didn't get rid of again so I guess you can say I achieved this! 3) In slight contradiction with my last point - spend more time with my family and friends. I feel like in 2013 I was always working/doing uni work/exercising and never seen my loved ones as much as I would have liked. This year I have to realise that they won't always be there and make all of my time with them. And have a little me time thrown in as well! 3) Achieved! I legit spend every waking moment with my parents - they are probably so sick of me but they are my best friends. 2014 was also filled with loads of adventures with my bezzies & Sam! 4) Travel more. I have always had the travel bug. Now I think 2015 will be the ultimate travel year as I will have graduated uni and my boyfriend and I are planning a trip to Dubai and Thailand (must make this happen!!!) But I still wanted to make a dent in the world this year. 4) I did go to Rome & few other places in 2014 which was great so I got to tick a few places off the map! I am right about 2015 though.. I currently have Dublin. New York and Thailand booked! Soooooo excited. Hopefully will be heading to Dubai with my mama as well! 5) Complete at least one thing on my bucket list. When I was about 13 I started a bucket list. Odd age to start it I know but I know how short life is and it shouldn't be wasted so I made one. In 2013 I managed to complete a lot of my bucket list but every year I'd like to do at least one thing on it. 5) I did it! I managed to tick so many things off my bucket list and I'm so chuffed that I did! I would say what they things were, but I haven't shown anyone what is on it, I just feel that it is too personal! 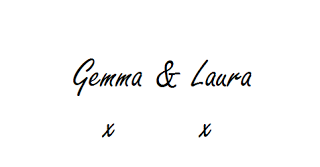 6) I know it is five points but I have another one, same as Laura, get a tattoo! I already have three but there is one I have been hoping to get for about a year. 6) Unfortunately I didn't get my tat. I'm not that fussed that I didn't get it because there is no rush to do it. There is always 2015!